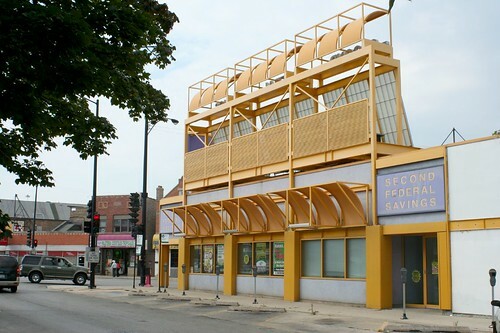 Architect W. Steven Gross designed this skeletal sailing rig of a building in 2000, for local bank Second Federal Savings. 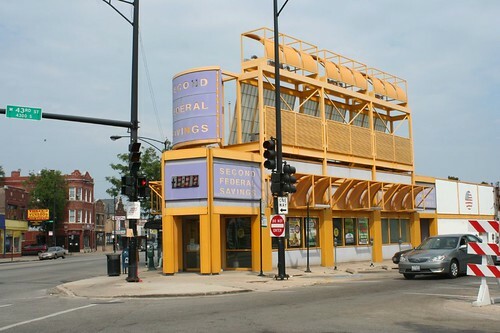 It’s a renovation of an existing one-story building, tricked out with metal fins and panels designed to screen the rooftop mechanicals (something all-too-often forgotten by designers and builders) and give the building some street presence. And oh does it ever! The two-tone purple has faded in the decade since its construction – the lighter tone, in fact, is almost lost. But the form remains as striking as the day it was built. 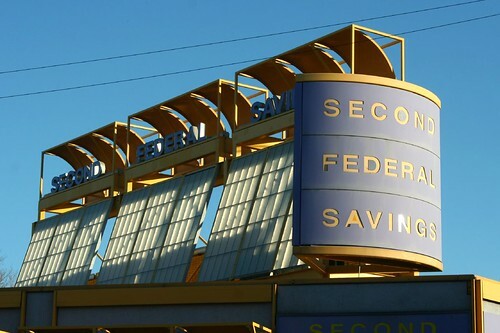 With roots going back well over a century, Second Federal Savings specializes in lending to the Hispanic community, and has been instrumental in building up the Little Village area over the last few decades. 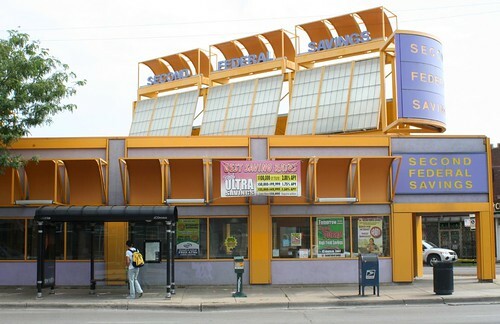 This building, at Archer and 43rd, is their third location; they also occupy a Mid-Century building on 26th Street and a 1996 building by Mr. Gross on Cermak Avenue. ← St. Demetrios and the Pod Buildings From Beyond! Before the bank, this was the Golden Coin Restaurant with your standard Americana/diner fare. Ah hah! A few online sources have it as the Silver Coin, though if that’s correct, I can’t blame you for conflating it with the Golden Heart restaurant across the street. In 1940 there was a Mrs. Steven’s Candy Shop in this location; in 1957 it became a Demet’s candy store; and that’s all I got. Shame on me, confusing my precious metals like that! You’re right! It was the Silver Coin.